I honestly don’t understand why sarcasm gets such a bad rap. It’s a very effective tool for so many things, especially teaching and parenting which are my main areas of expertise and experience. People rush to hear my very words on the subject. Yes, that was sarcasm. First lesson complete. Second sarcasm lesson: Sometimes it works, sometimes it’s just amusing. I love it when a Johnny catches on and plays with me. “No, by all means, Johnny, sneeze into your hands and then ask me to borrow a pencil; that’s a good science experiment. We can track how many people use that pencil today and see who stays home sick tomorrow and the next day, what do you say?” “I say, Mrs. Sarcasm, that unless I’m getting extra credit this conversation is over.” Well done, Johnny! Now wash those hands and come get a pencil. You have redeemed yourself in my sarcastic eyes and the class is smiling. We all know smiling students are learning students, right? 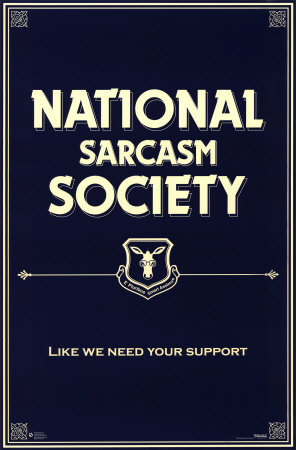 Third sarcasm lesson: wait long enough, and justice shall surely be served. Sarcasm is an effective parenting tool, as well. Update! Haven’t walked since that first day, aren’t you proud? I did spend three days helping my daughter move out of her apartment, but since I rewarded myself each day with pizza or burgers, I don’t think I’m going to count that in the self-improvement checklist of my life.